While we make reasonable efforts to provide accurate and timely information on this site, you should not assume that the information provided is always up to date or that this site contains all the relevant information available about Knights of Columbus Assembly #2381. COPYRIGHT AND TRADEMARK. Unless otherwise noted, all materials on this site are protected as the copyrights, trade dress, trademarks and/or other intellectual properties owned by the Knights of Columbus Assembly #2381 and/or its subsidiaries and affiliates or by other parties that have licensed their material to the Knights of Columbus Assembly #2381. PERSONAL USE. Your use of the materials included on this site is for informational purposes only. You agree you will not distribute, publish, transmit, modify, display or create derivative works from or exploit the contents of this site in any way. You agree to indemnify, defend and hold harmless the Knights of Columbus Assembly #2381 for any and all unauthorized uses you may make of any material on the site. You acknowledge the unauthorized use of the contents could cause irreparable harm to Knights of Columbus Assembly #2381 and that in the event of an unauthorized use, Knights of Columbus Assembly #2381 shall be entitled to an injunction in addition to any other remedies available at law or in equity. 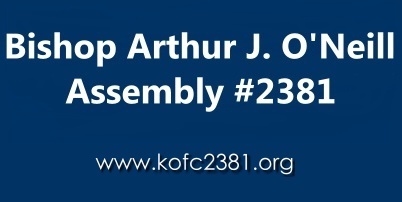 While we appreciate your interest in Knights of Columbus Assembly #2381, we do not want and cannot accept any ideas you consider to be proprietary regarding designs, product technology or other suggestions you may have developed. Consequently, any material you submit to this site will be deemed a grant of a royalty free non-exclusive right and license to use, reproduce, modify, display, transmit, adapt, publish, translate, create derivative works from and distribute these materials throughout the universe in any medium and through any methods of distribution, transmission and display whether now known or hereafter devised. In addition, you warrant that all so-called "moral rights" have been waived. LINKS. Some links on the site will allow you to connect with sites that are not under our control. Knights of Columbus Assembly #2381 is providing these links only as a convenience. The appearance of a link does not imply Knights of Columbus Assembly #2381 endorsement, nor is Knights of Columbus Assembly #2381 responsible for the contents of any linked site. You access them at your own risk. PRIVACY & SECURITY. For an explanation of Knights of Columbus Assembly #2381 practices and policies related to the collection, use and storage of our online guests' information, please read our Privacy Statement. DISCLAIMER. Except as otherwise expressly stated with respect to our products, all contents of the site are offered on as "as is" basis without any warranty whatsoever either expressed or implied. Knights of Columbus Assembly #2381 makes no representations, express or implied, including without limitation implied warranties of merchantability and fitness for a particular purpose. Knights of Columbus Assembly #2381 does not guarantee that the functions contained in the site will be uninterrupted or error-free, that this site or its server will be free of viruses or other harmful components, or that defects will be corrected even if Knights of Columbus Assembly #2381 is aware of them. MINORS. The Knights of Columbus Assembly #2381 asks that parents supervise their children while online. No information should be posted by minor children without parental consent. JURISDICTIONAL. Any dispute arising from these terms shall be resolved exclusively in the state and federal courts of the State of Illinois. Knights of Columbus Assembly #2381 makes no representation that materials in this site are appropriate or available for use in other locations. If you access this site from outside the United States, be advised this site may contain references to services that are not available or are prohibited in your country.